As harvest draws to a close, vast expanses of land lay bare providing an irresistible opportunity for hare coursers to pursue their illegal hobby. Some may consider hare coursing to be harmless but the reality is far more sinister than just a few people in a field with dogs. Hare coursing is high-stakes unlawful betting activity with the chase often being filmed and replayed later in a social setting where large amounts of money change hands illegally. The dogs are worth thousands of pounds, especially those that regularly win the chase. Apart from the obvious damage to land and fences, individuals that fall victim to this crime on their land are often faced with threatening behaviour from the perpetrators if they’re asked to leave. Police officers have reported that coursers that have been arrested often have a string of other convictions to their name. In short, those in pursuit of hare coursing are generally ‘unsavoury’ characters. 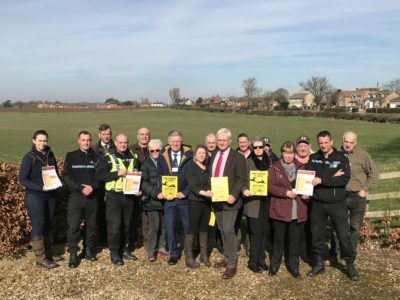 I’ve been working with land owners and police forces across Lancashire, West Yorkshire and Humberside in the fight against hare coursing with a campaign to encourage farmers and landowners to report incidents to the police. This in itself can be a challenge as it is often difficult to use the 101 police non-emergency phone service and victims feel that nothing is done when they report an incident. Farmers are also afraid to report coursing activity for fear of retribution. However, the only real deterrent against this crime is prosecution, and for these criminals to be brought to justice the police need good quality evidence. The CLA is encouraging farmer, landowners and the public to report any suspicious activity to the police, either by calling the police non-emergency number 101 or crime stoppers 0800 555 111 https://crimestoppers-uk.org/. The police need to know what you have seen and why you think it is suspicious. Try to record and report the date, time and location of the activity along with a description of any vehicles, people, dogs and direction of travel. The description of the vehicle should include the make, model and colour along with any unique features, as well as the registration number (which could be fake). It is unlikely the police will come out to visit the scene of the potential crime but the information you record and report could be a vital piece of evidence that could help bring criminals to justice. Our campaign has seen a degree of success with more reports coming forward and more convictions being made. However, we still have more work to do as the problem we now face is that sentences handed to the criminals is a long-way short of a deterrent. We’ve made an approach to the Magistrates Association to see if more can be done to bring forward tougher sentencing for convicted criminals. It seems deeply unfair that the public and the police are putting in a lot of work to bring these criminals to justice yet they are handed pathetic fines amounting to just a few hundred pounds. Many victims feel disheartened by the low sentencing. The police may use one of two laws to bring criminals to justice. If there is evidence that they are simply in the field with a dog then the police will bring a prosecution under the Game Act 1831 which carries a maximum fine of level 3 (£1000). If there is evidence that the offenders have actually been chasing prey then they will use the Hunting Act 2014 which carries an unlimited fine (this was previously capped at £5000 but extended in 2015). The CLA advice is not to confront suspected hare courses but instead take the time to write down accurate details of the incident (this can be done via notes on a smartphone) and report them to the police as soon as practicable. Crimestoppers will accept anonymous reports which could be more attractive to farmers and landowners who fear retribution from the criminals.